British businesses are dealing with a sharp rise in late payments, coupled with slow adoption of technology to manage collections and recovery, according to a new report by FICO (NYSE:FICO), a leading predictive analytics and decision management software company, and Marketforce. 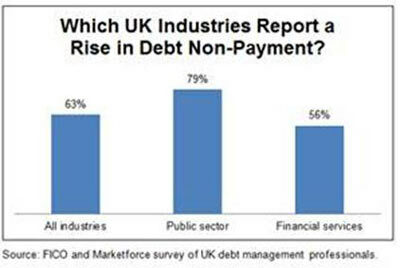 In this survey of 180+ UK executives with responsibility for debt collection and recovery, 6 out of 10 respondents reported rising levels of non-payment in the last 12 months; for public sector organizations, the number was 8 out of 10. Almost two-thirds (65 percent) reported an increase in the number of debtors experiencing delinquency for the first time. Despite the increase in collections queues, UK collectors representing financial services, utilities and water companies, telecoms providers, public sector organizations and debt collection agencies said that they are not using data and technology to their full advantage. 87 percent agree that a lack of historical data on the behaviour of debtors experiencing delinquency for the first time makes it vital to analyse other types of information to predict behaviour. However, 81 percent are not analysing data from payday lenders, an early warning system of financial distress, and 74 percent have no plans to use the potentially valuable data held in social network profiles and social media sites. Furthermore, 44 percent are not analysing recordings of calls collectors have with debtors, 28 percent are not analysing call centre notes and 22 percent are not analysing correspondence from the debtor. The survey found widespread adoption of predictive analytics to fine-tune collection and recovery strategy and deliver consumer-specific treatments. Almost 60 percent of respondents are using analytics to segment debtors and tailor their collection approaches, or plan to do so in the next 12 months. The industry with the widest adoption of analytics – financial services – had the fewest respondents reporting a rise in non-payments. However, investment in online and mobile payment systems still lags. Ten percent don’t enable repayment online and have no plans to do so, and more than half (57 percent) don’t have systems that enable mobile payments. Of these, 26 percent plan to invest in mobile over the next 12 months, leaving 31 percent with no plans to enable mobile payments. A copy of this report is available online. FICO (NYSE: FICO), formerly known as Fair Isaac, is a leading analytics software company, helping businesses in 80+ countries make better decisions that drive higher levels of growth, profitability and customer satisfaction. The company’s groundbreaking use of Big Data and mathematical algorithms to predict consumer behavior has transformed entire industries. FICO provides analytics software and tools used across multiple industries to manage risk, fight fraud, build more profitable customer relationships, optimize operations and meet strict government regulations. Many of our products reach industry-wide adoption — such as the FICO® Score, the standard measure of consumer credit risk in the United States. FICO solutions leverage open-source standards and cloud computing to maximize flexibility, speed deployment and reduce costs. The company also helps millions of people manage their personal credit health. FICO: Make every decision count™. Learn more at www.fico.com.